Building and Woodworkers International (BWI) Philippine affiliates Associated Labor Unions (ALU) and National Unions in Building and Construction Workers (NUBCW) will observe the International Workers Memorial Day (IWMD) on Tuesday, April 28th and jointly launch the ‘Workers’ Rights on Wheels’ (WROW) as a tool to raise awareness among employers, government and workers of their labor rights and responsibilities. Not more 200 members from ALU and NUBCW will march with their WROW vehicles to the Philippine Labor department’s Occupational Safety and Health Center (OSHC) office to publicly address government negligence amid the rising patterns of safety lapses in the construction work sites that caused the death and injury of several workers. The participants will then handover a call to action addressed to the Center containing demands to revive the tripartite safety inspection patrol, stronger penalty against project owners and contractors who violate safety standards and prescribed wages, and limit to only three the layers of sub-contracting. Prior to the march, participants will be given updates on ban asbestos campaign and will be given tips on improving health and safety practices in the workplace. The morning gathering will be highlighted by an indoor candle lighting ceremony in observance of the IWMD. 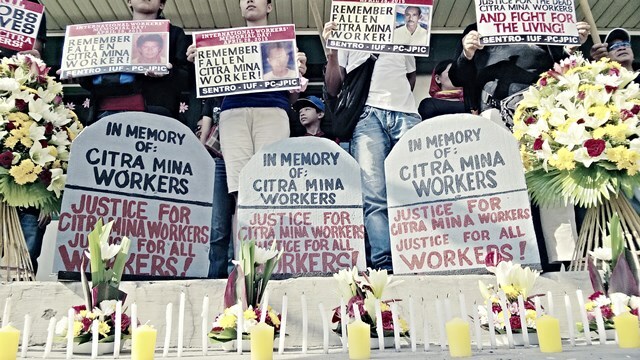 For this 28th April, the IOHSAD, KMU and ILPS Philippines will be organising a union event in Plaza Miranda, Manila, in commemoration of Filipino construction workers who lost their lives as a consequence of unsafe working conditions, raising the inconvenient correlation between GDP growth, raising construction investments and workplace deaths.